Retirement Online -- The voices of retirees on retirement issues! Please forward this retirement newsletter to your online friends! They'll appreciate your thoughtfulness and we will too! Thank you. If you received this issue from a friend, you can insure against missing the next issue by clicking below! Subscribe here to the Retirement-Online Newsletter! What will YOU do in retirement? click here - You need to read this! 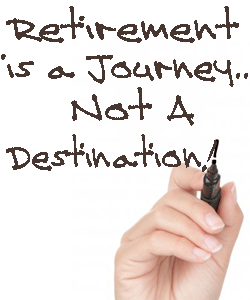 Top Ten Reasons to Retire: free ebook & ezine.. Get Yours! Take My Retirement Survey Today! Sometimes, a beautiful post that makes my heart sing! Retired: Alone in a Crowded Room. Sometimes your two cents can make a difference in someone's life! Good Life but Just not Happy. Retire to the Internet, Like I did! What Lies Behind Us and What Lies Before Us Are Tiny Matters Compared to What Lies WITHIN US!